Happy Friday friends! As David and I set up for these pictures, we listened to a local Atlanta jazzy, ragtime band (listen here)! While I thought he was focusing the lens, Bandit and I were enjoying the tunes. But instead, David was snapping away - which brings us to this silly .gif (also proof Bandit is real, not stuffed or ceramic)! Have a wonderful weekend. very cool blazer & gorgeous bag! Ooooo! I love this blazer! Such a cute rabbit! 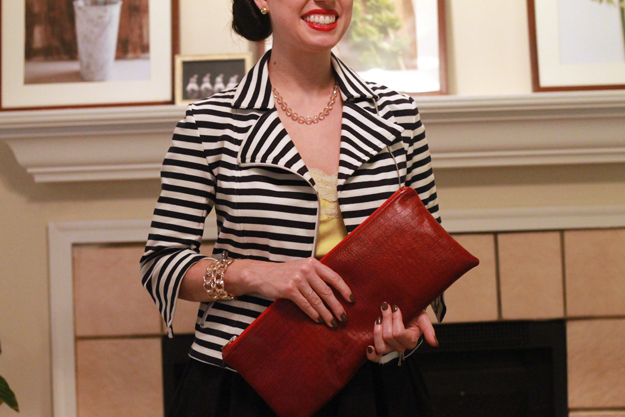 Love the outfit and awesome job on the clutch. Look at how cute you too are!!! And seeing this striped blazer makes me want to get one right now! cute and classic and I love the bunny! this is TOO CUTE! love little bandit hopping away! I love that bag, and your hair is PERFECTION!!!!!!!! xO! I love the idea of the last picture! You look very elegant! I wouldn't wear the yellow top in this outfit, but on the other hand, it's shinny to transform the look not so black and white. In LOOOOOOOOVE with this outfit! 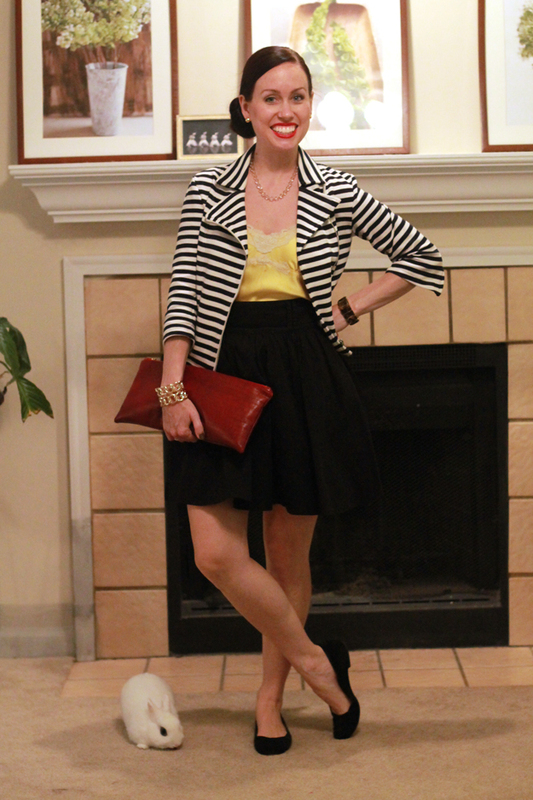 I love the black and white with the pop of yellow and that blazer is a great F21 find :). Bandit is so super cute too! hey thanks for the comment on my blog! I'm loving yours, your style is great. I'm now following you i would love a follow back!! Love your striped blazer and your hair looks so pretty! Thanks for visit and comment on my blog, would you like to follow each other? you look amazing!! love your blazer!! Oh gosh, Bandit steals the show!! I love this look. Aw! I don't think I've said this yet, but Bandit is so darn cute!! Also, I am in love with your striped blazer! I love the jacket! Thank you for comment! So adorable, and I LOVE that blazer, can't believe it is from Forever 21! You have a great style - always perfect and cute!